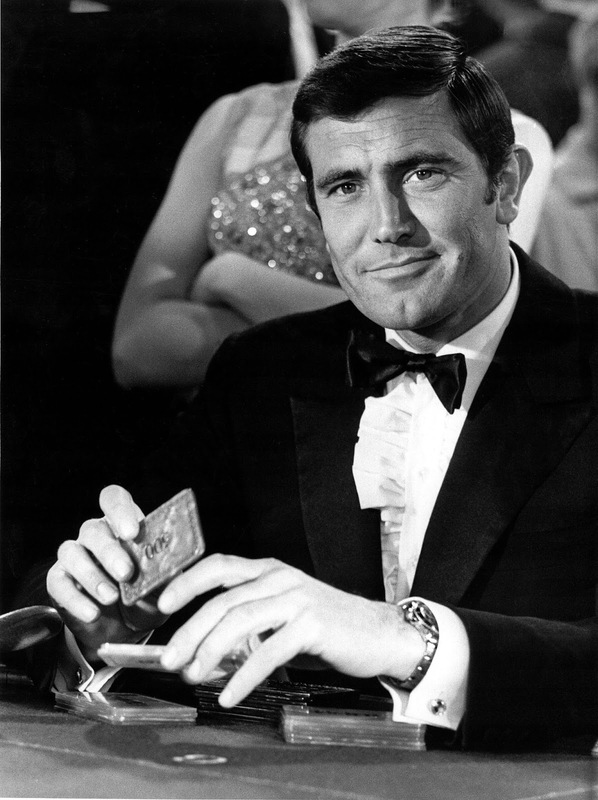 George Lazenby wore two different Rolex watches when he played James Bond. 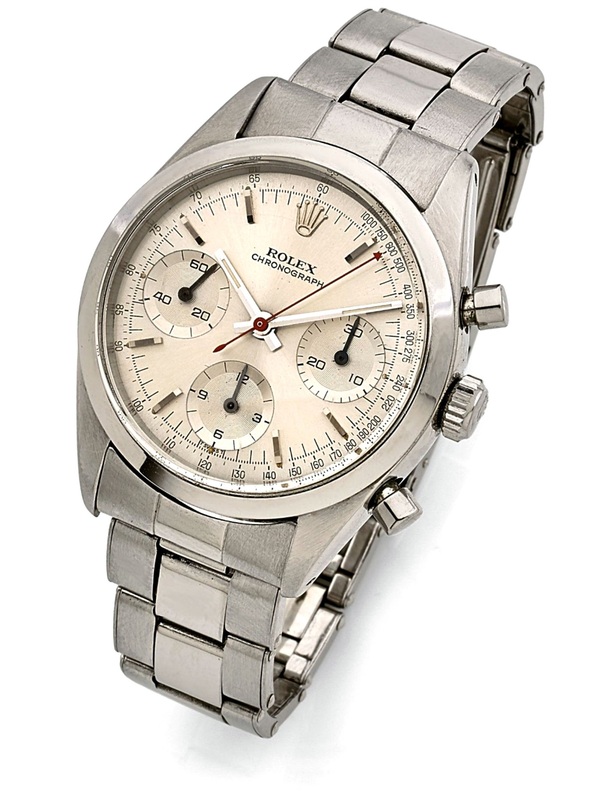 He wore a Rolex Submariner and a Rolex pre-Daytona chronograph which is pictured below. This watch came to auction in 2016 but apparently did not sell. I don't know why, but I imagine it was withdrawn because it did not meet the reserve, but I do NOT know that to be a fact. 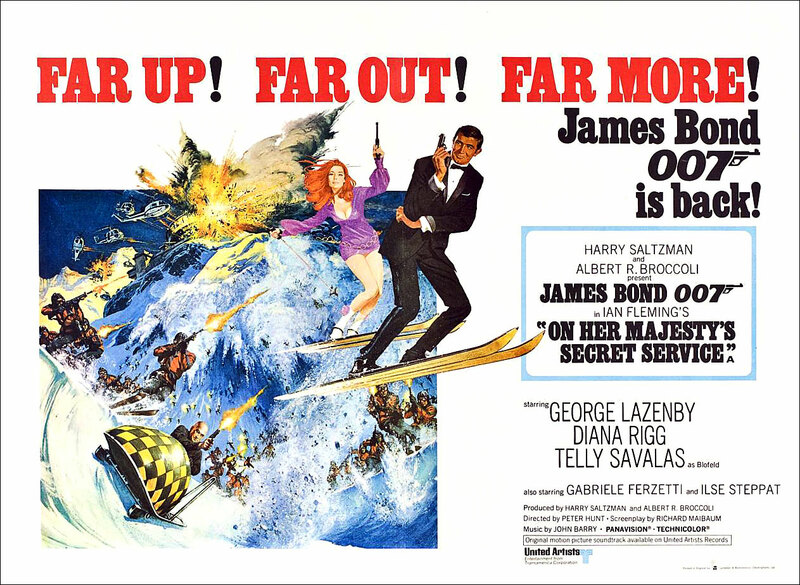 Sean Connery grew tired of playing James Bond and in 1968 decided to move on with his acting career. 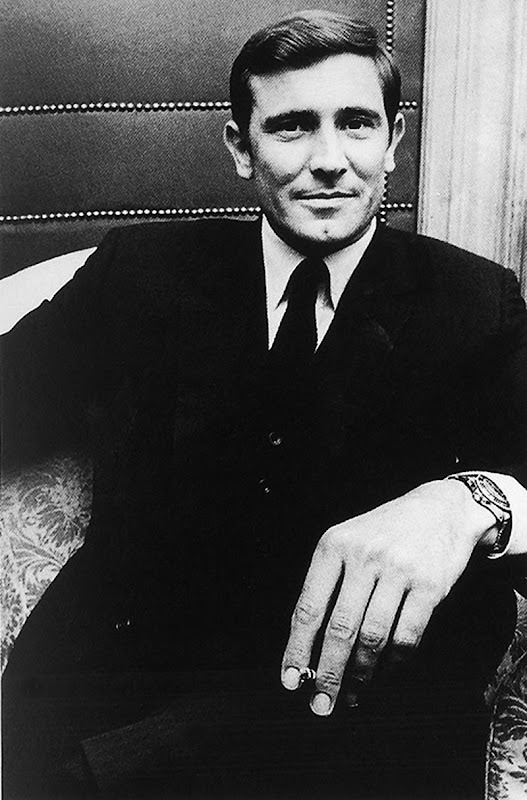 Albert Broccoli, the producer of James Bond approached Burt Reynolds and offered him the role. 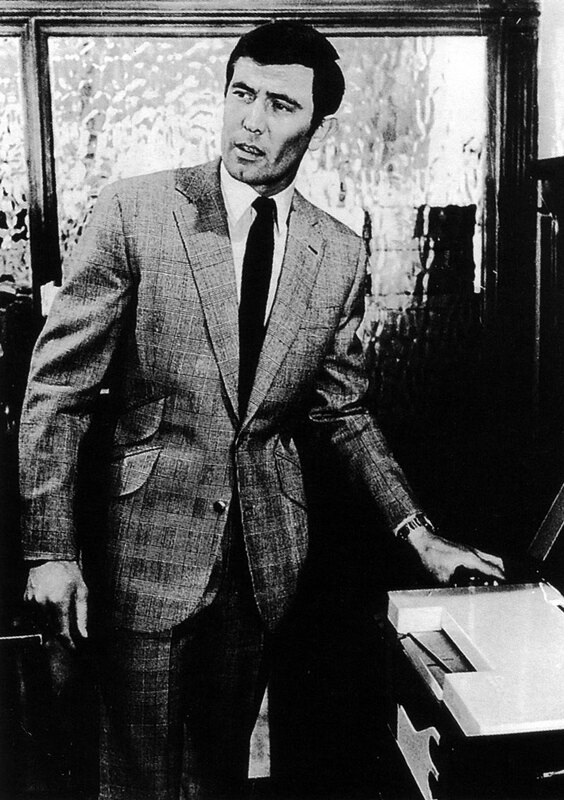 Burt Reynolds claimed he rejected the role saying "An American can't play James Bond. It just can't be done!!!" It sure is interesting to wonder what would have happened if Burt Reynolds had accepted the role? Kind of like, wondering what Raiders Of The Lost Ark what have been like if Tom Selleck played Indiana Jones instead of Harrison Ford!?! 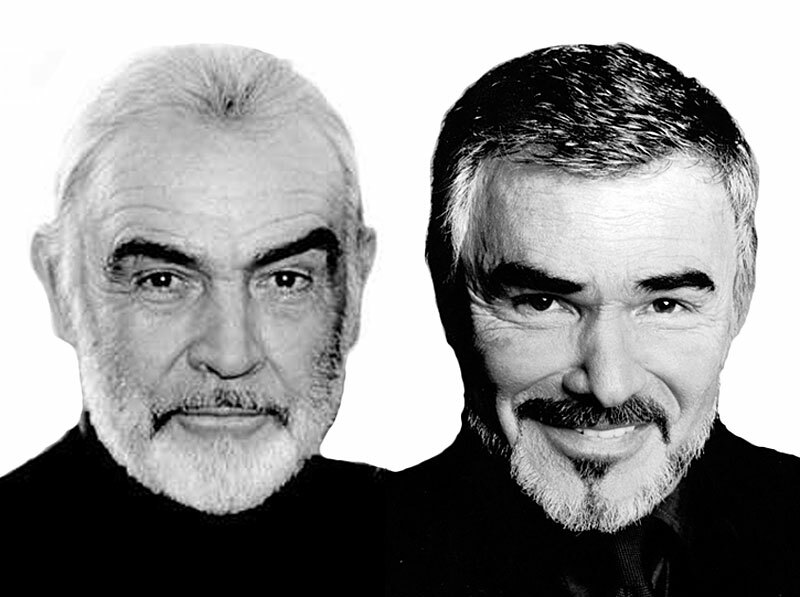 It is also interesting to see how remarkably similar Sean Connery and Burt Reynolds look when they got older. By the way, both Sean Connery and Burt Reynolds are wearing toupees in this photo. 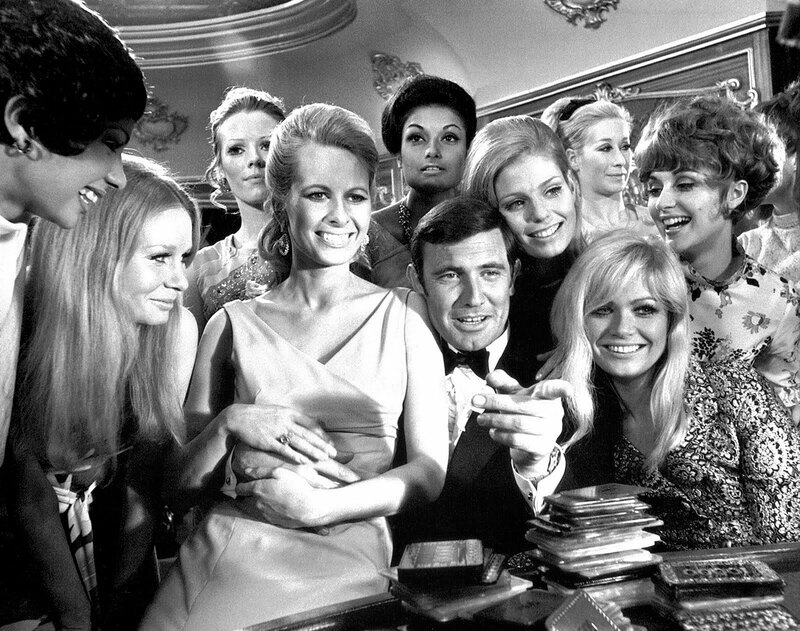 Sean Connery had played James Bond for five straight movies and decided it was time to move on in his career. 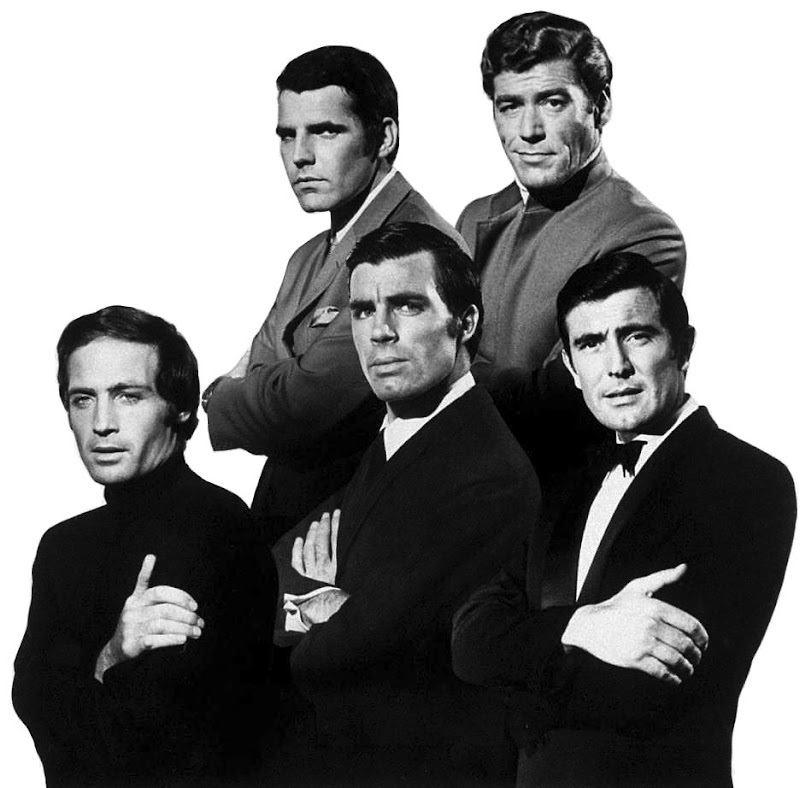 EON productions had to find a replacement in 1968 and narrowed down the field to these five British actors. 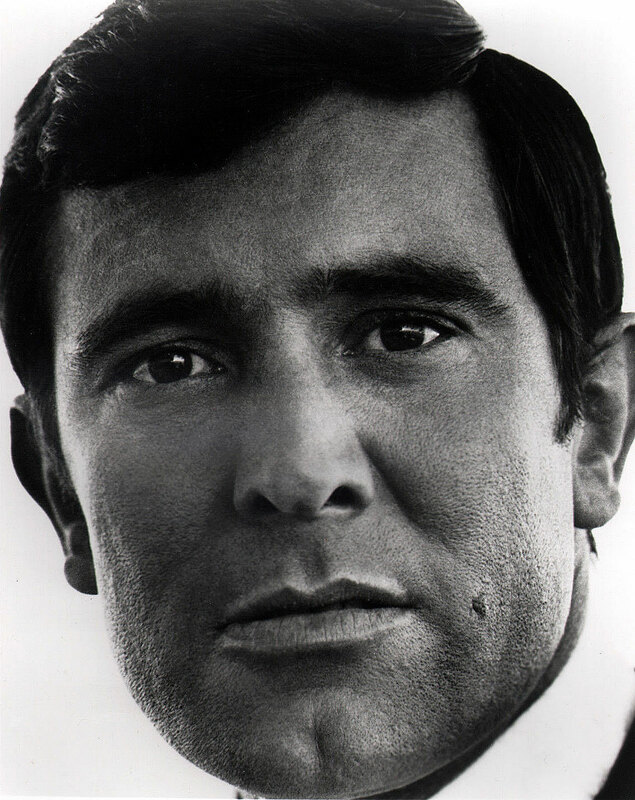 Of course, George Lazenby was chosen. 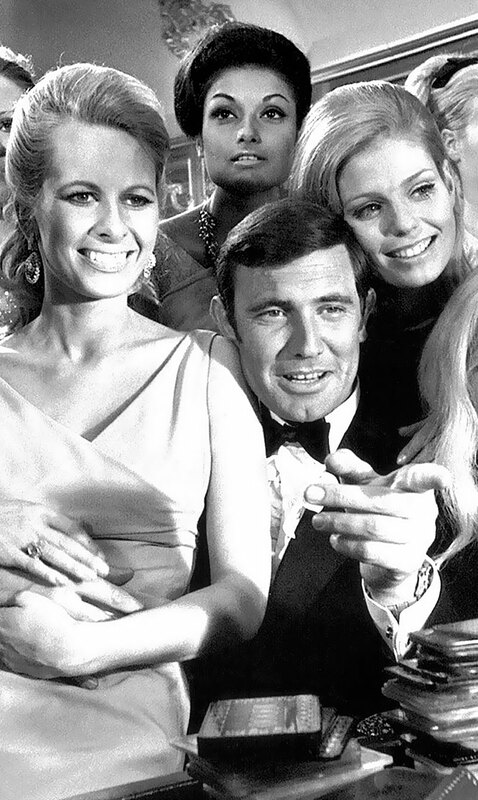 George Lazenby is located on the bottom right-hand side of the photo below. 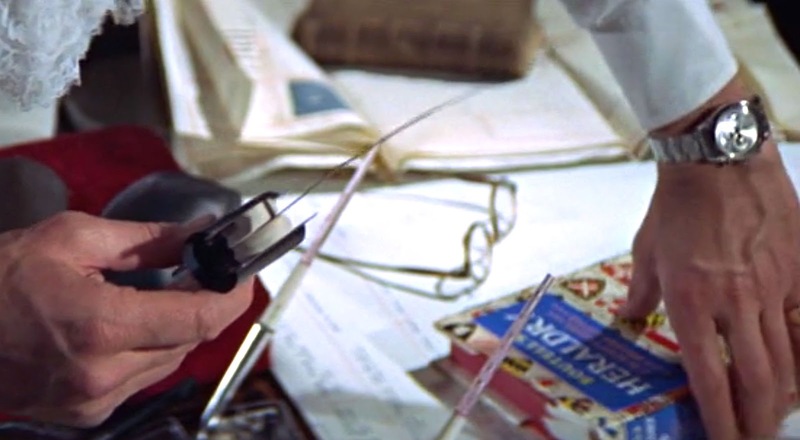 "Bond surveyed his weapons. They were only his hands and his feet, his Gillette razor and his wrist-watch, a heavy Rolex Oyster Perpetual on an expanding metal bracelet. Used properly, these could be turned into most effective knuckle busters." 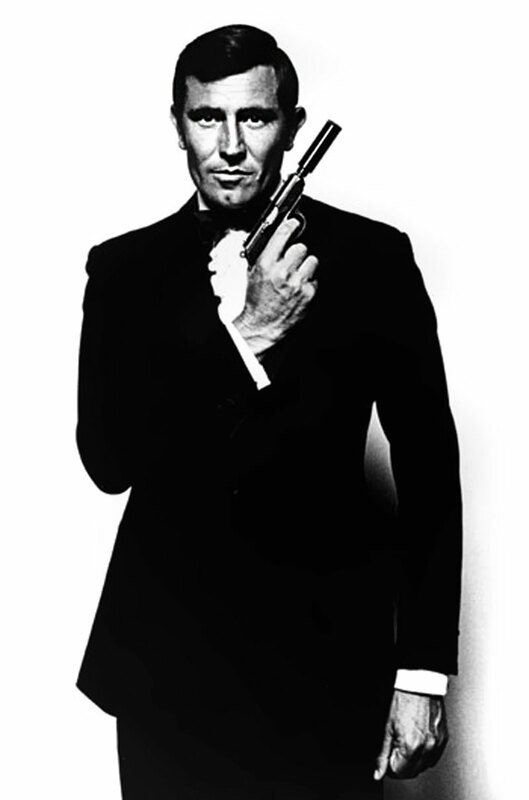 –Ian Fleming [On Her Majesty's Secret Service]. 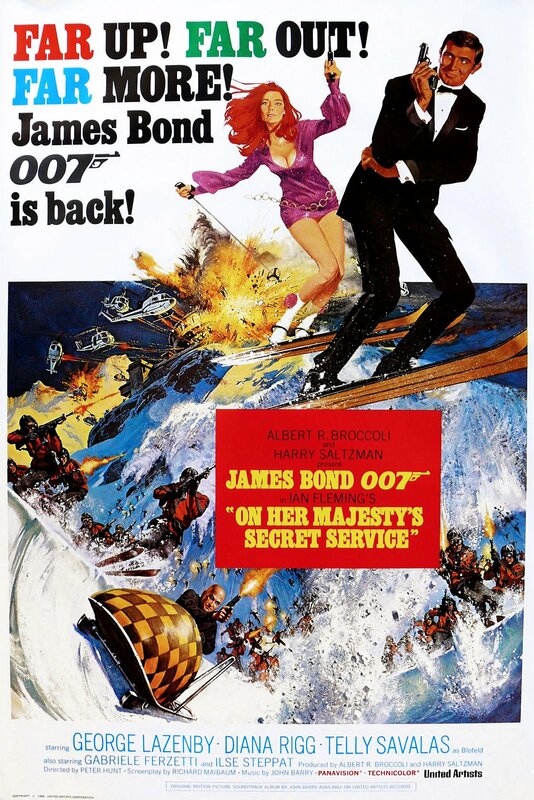 Here is a really cool French version of the movie poster for On Her Majesty's Secret Service. 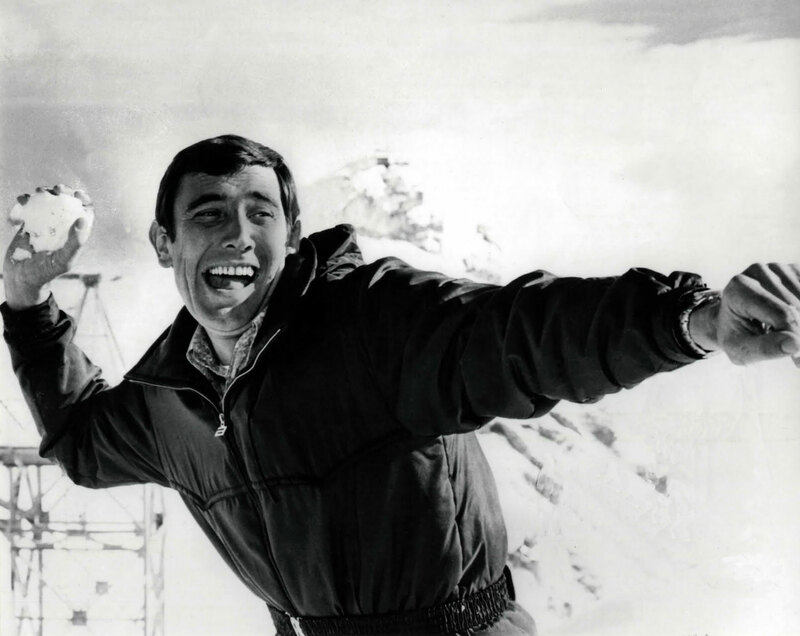 Before becoming James Bond, George Lazenby was a superb skier and overall athlete. 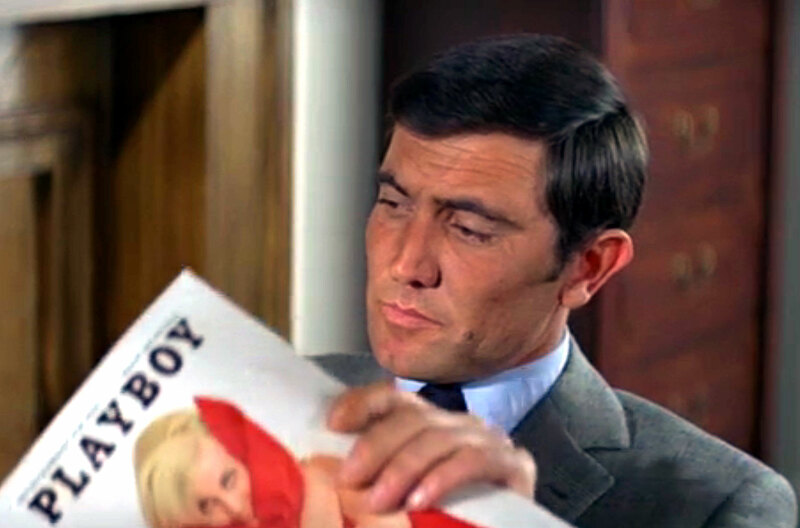 In the poster image below, George Lazenby as James Bond is shown wearing his Rolex Pre-Daytona Chronograph. 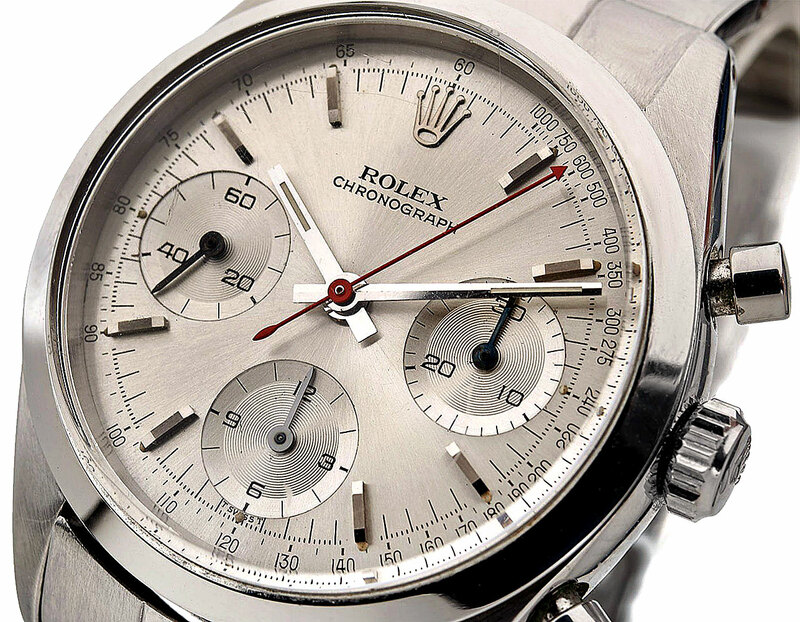 There was something just so cool about wearing a Rolex and Skiing. It had to do with how sturdy and waterproof the Rolex watch was. If you ski, you probably know what I am talking about. 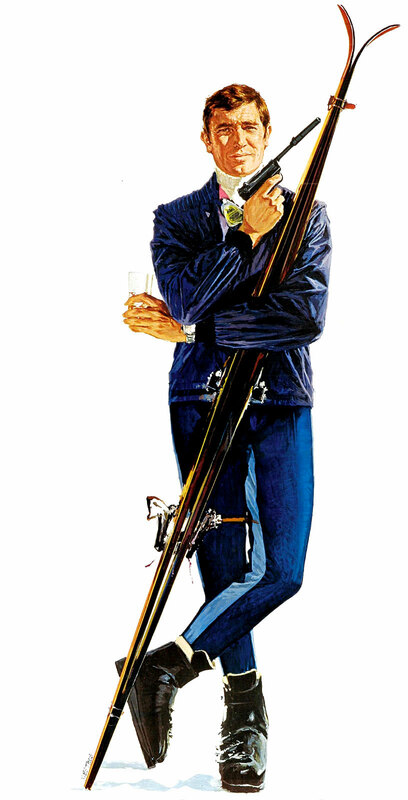 Thus it is ironically cool that George Lazenby is pictured above wearing his Rolex Pre-Daytona in his ski outfit. Very Cool if you ask me!!! 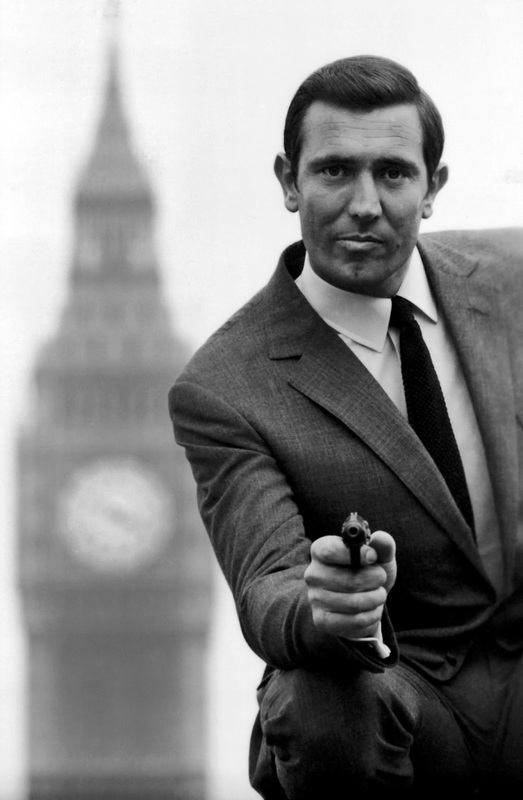 George Lazenby only played James Bond once. 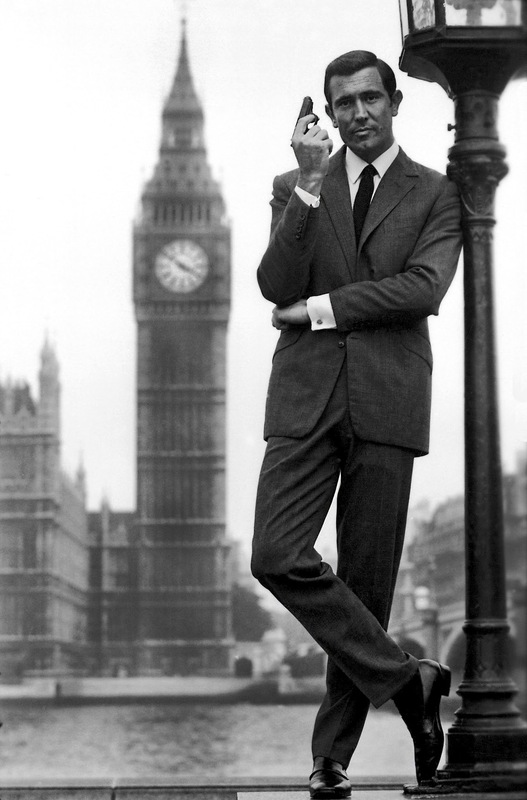 Believe it or not, he was offered a 7 movie contract to play James Bond and he turned it down!?!?! 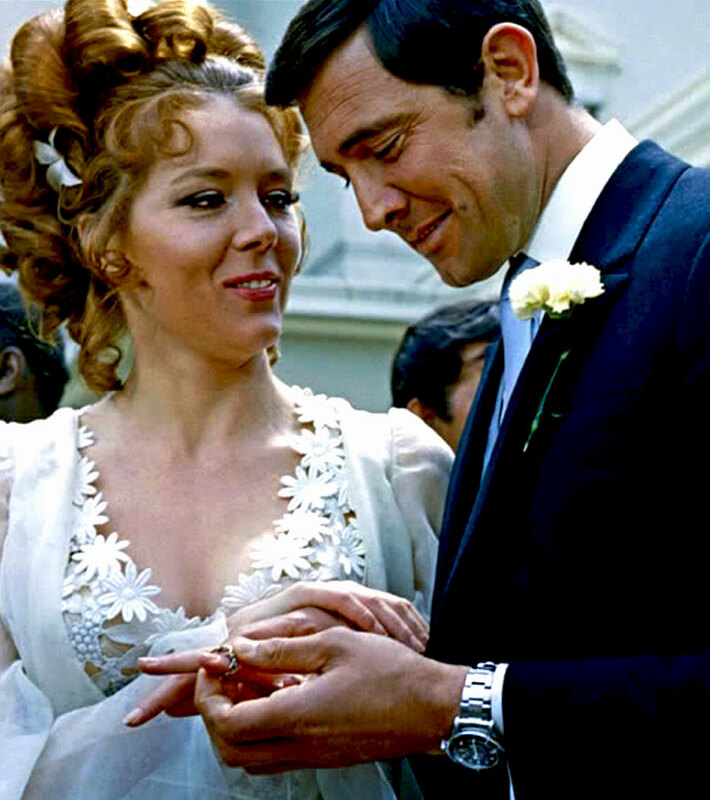 In On Her Majesty's Secret Service, Lazenby wore two different Rolex Watches. He wore a Rolex Submariner as seen in the first four pictures below and in the last next two images that follow he is wearing a Pre-Daytona Rolex Chronograph. 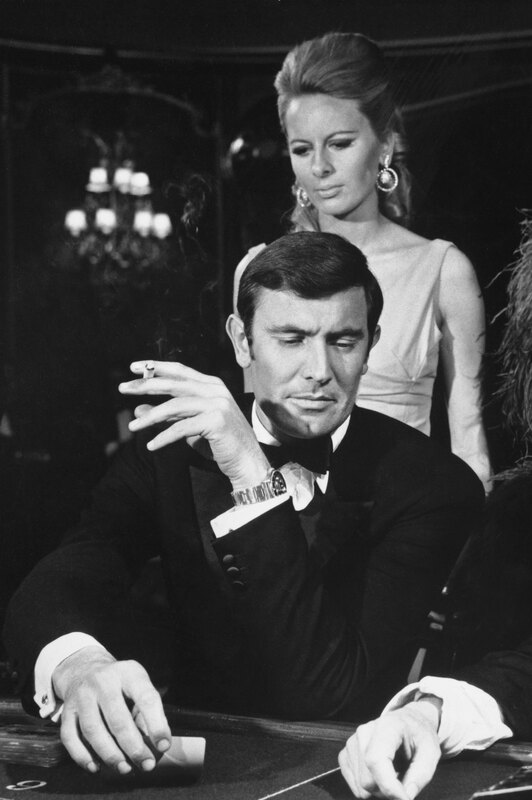 Apparently, Lazenby purchased the Rolex Submariner he wears in the movie to wear for his audition for the role of James Bond. The Cure sings a song named Why Can't I Be You? 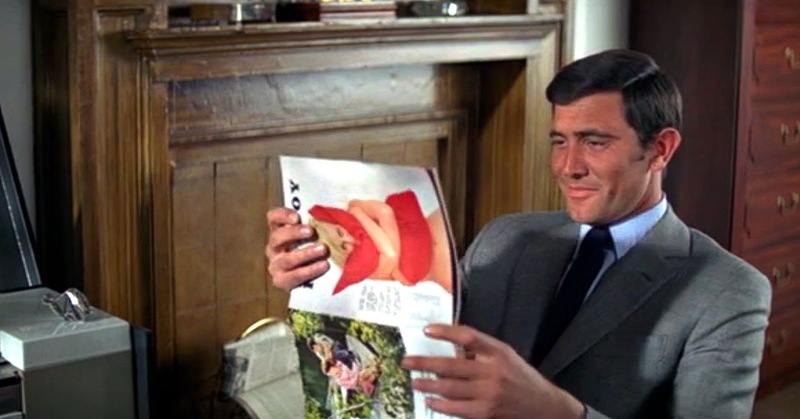 and that is exactly how George Lazenby felt about Sean Connery. 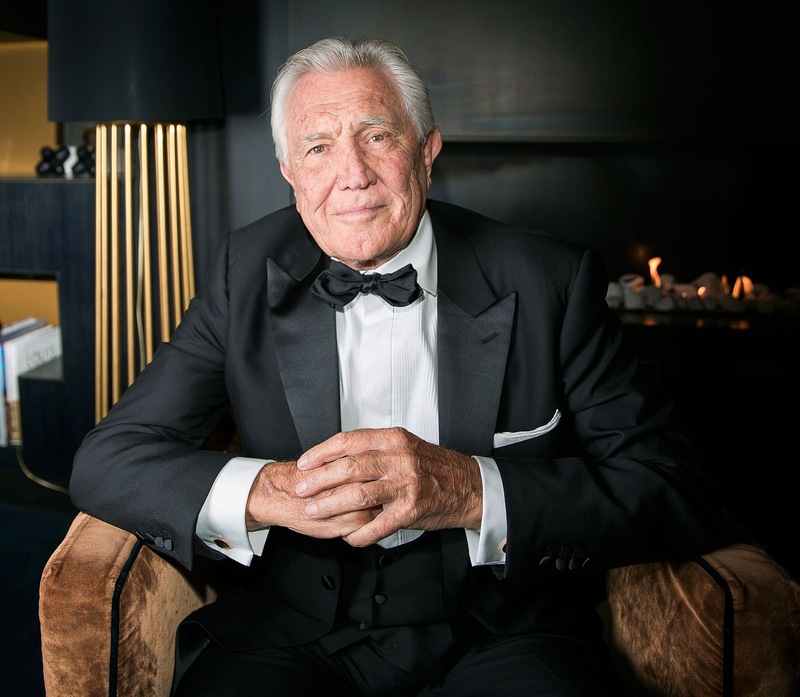 In his obsession to replace Sean Connery as James Bond, George basically became Sean Connery, and if you watch the fascinating interview below this photo, you will learn straight from George Lazenby how he became Bond. 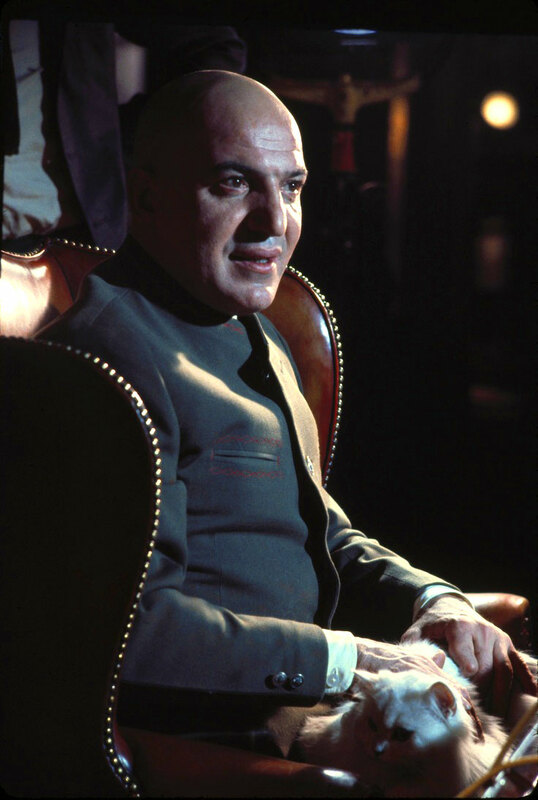 Telly Savalas plays Ernst Stravo Blofeld–Bond's arch nemesis–leader of SPECTRE. 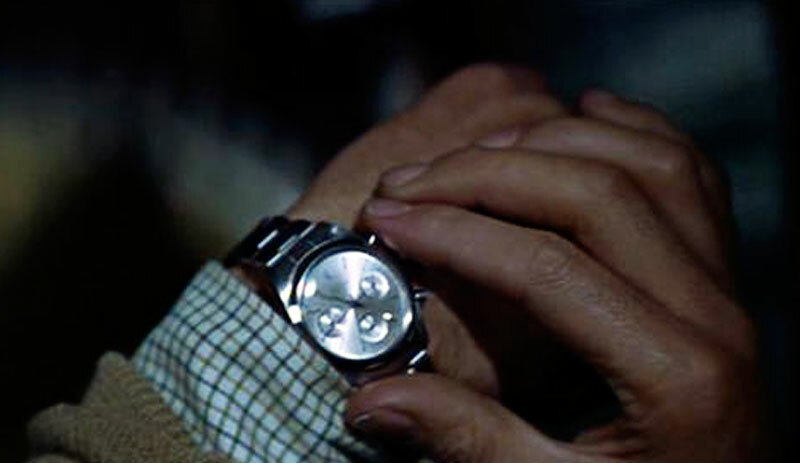 Roger Lazenby wore two different Rolex watches when he played James Bond in On Her Majesty's Secret Service. First, he wore the Rolex Submariner seen in the photos above, and he also wore a stainless steel Rolex Daytona, as seen in the photos below. 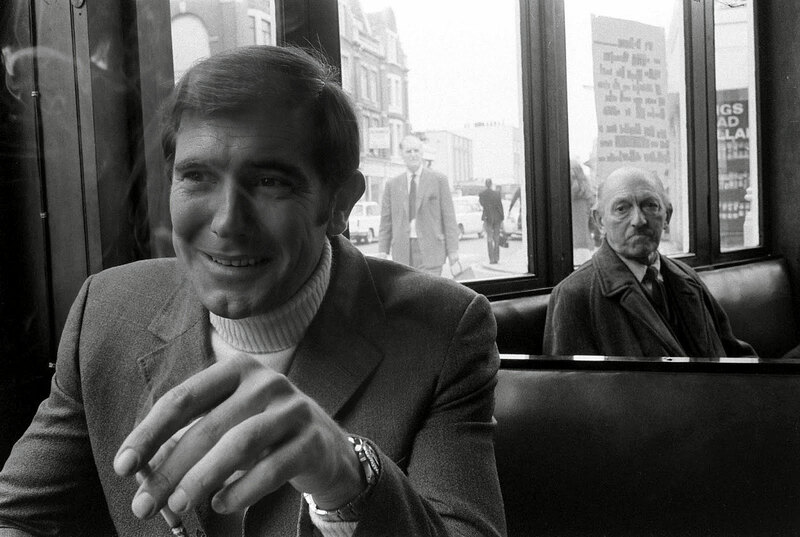 The Rolex in the photo below is the actual watch George Lazenby wore. 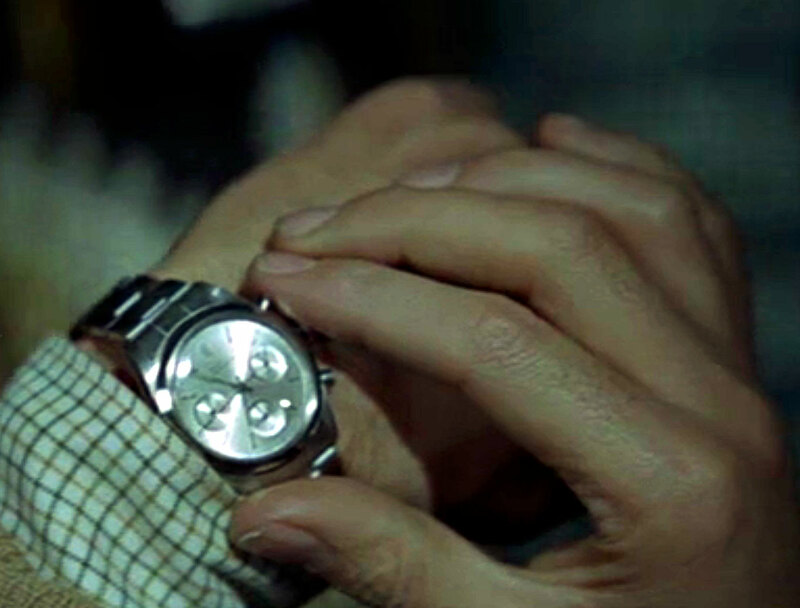 Still Wearing Rolex 50 Years Later!!! 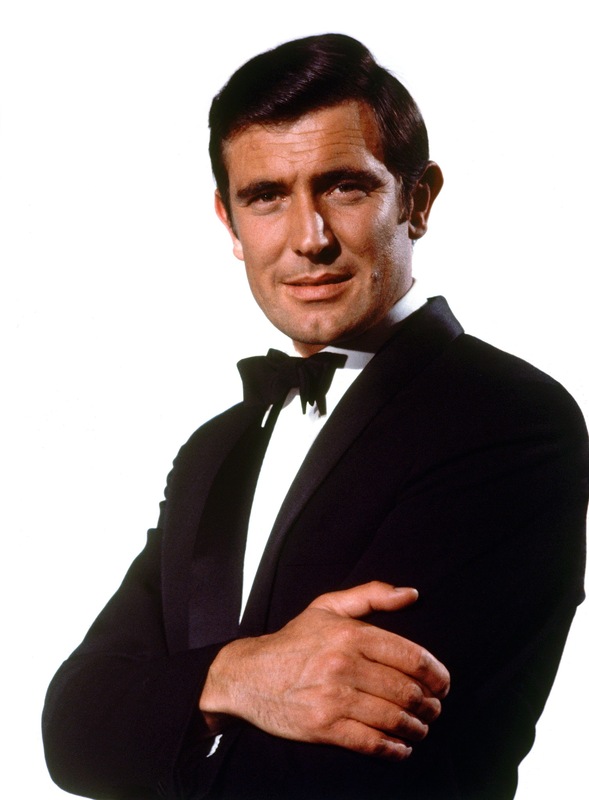 Actor George Lazenby replaced Sean Connery in the role of James Bond in 1969 in On Her Majesty's Secret Service. 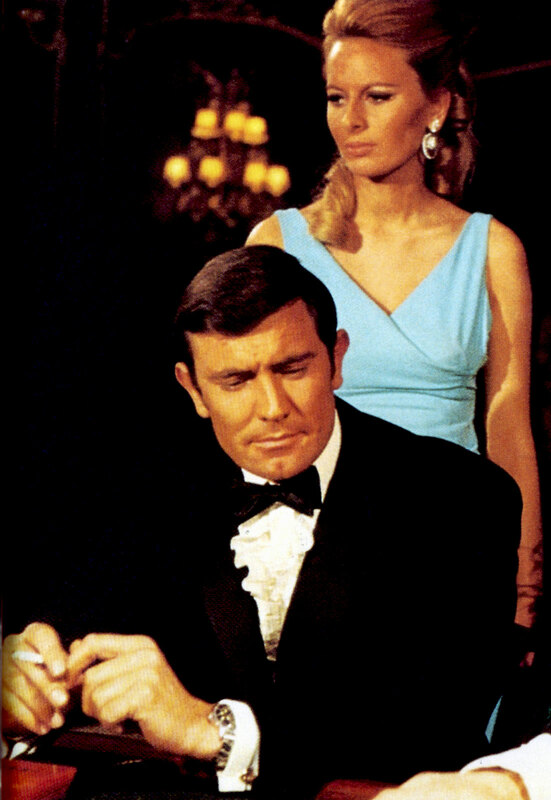 George Lazenby only played James Bond once but interestingly he wore a Submariner and a pre-Daytona Albino Rolex Chronograph in On Her Majesty's Secret Service. 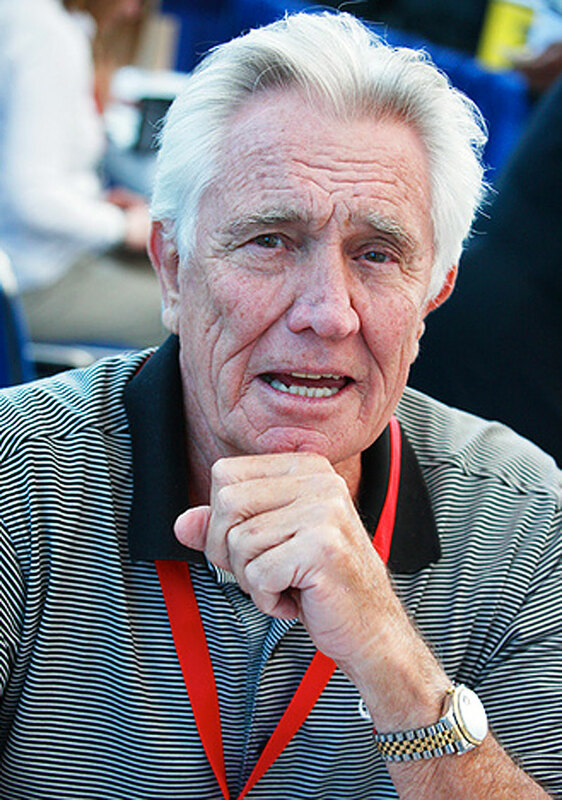 To this day George Lazenby still wears a two-tone Rolex Datejust as seen below. I imagine, like Daniel Craig, he prefers Rolex in his real life. 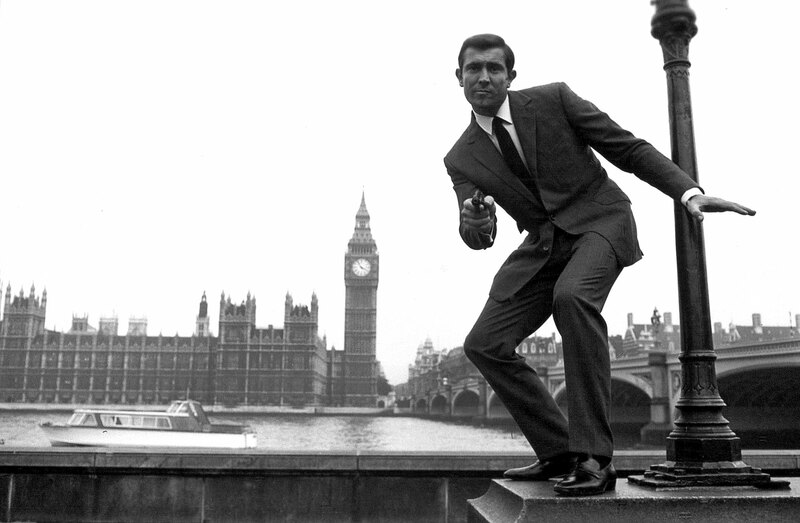 You can learn much more about George Lazenby and the history of James Bond Watches by clicking here. 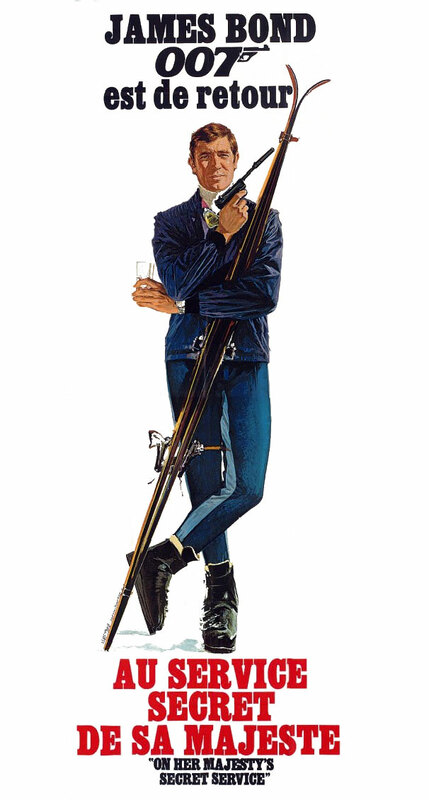 I think it would be really cool if in the next James Bond movie if they brought back Lazenby to play a different character. You know, like one of the older dudes James Reports to. Wouldn't that be really cool!! !